After yesterday's emotional post, I thought I would make a bright and cheerful card for you today. The cute stamps and dies I used are from Reverse Confetti. You can click right here to see the stamp set which is called, The Buzz. My sentiment is from Paper Smooches and I thought it coordinated perfectly! And have you seen that MFT Stamps sells patterned paper now? I used a sheet from one of the new 6x6 pads and I love it!! 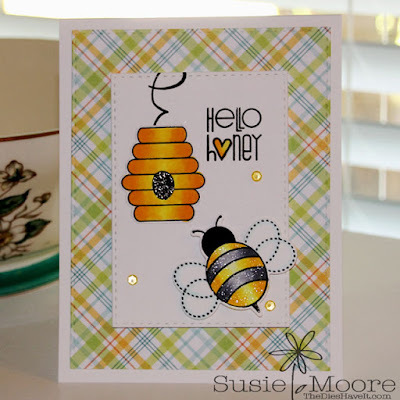 And of course I can't stop using the Stitched Rectangle dies from Simon Says Stamp. How in the world did I ever craft without them?? Do you have favorites like that too?